These are the best ones I have seen! The statement about punctuation needs to be fixed. Where are the social studies and science common core standards? Wow, these are awesome!! Thanks so much for sharing! Thank you so much. My students thank you too. These ares the best. These are AWESOME! We can use these in the student data binders so that they can keep track of what they know too! Do you happen to have these wonderful I Can Posters for third grade? If so, could you please send me a link? 6th grade will be added this summer! Thank you, thank you, thank you for provided a tool to make our jobs more manageable! This is amazing! Thank you, thank you, thank you for providing a tool to make our jobs more manageable. This is amazing! Thank you for putting the Common Core standards in an easy to understand format. As a homeschooling mom, I am working to make sure that my first grader is meeting all of the Common Core requirements. It’s reassuring to have this list to refer to, and to be able to check off boxes as we go, and see where we need to improve or work harder. Super!!! Do you have this layout for science & social studies? Hi Janine! We don’t currently have this for science and social studies, but we’re looking into it and will be getting to work on the science standards this summer! Thanks so very much for sharing! This is really helpful as I transition from teaching fifth grade to first grade. Your hardwork is greatly appreciated! May God richly bless you for blessing the educators’ community. Thank you making CCCS so friendly and EASY for me to understand. Can’t wait for social studies and science. Have a great summer. 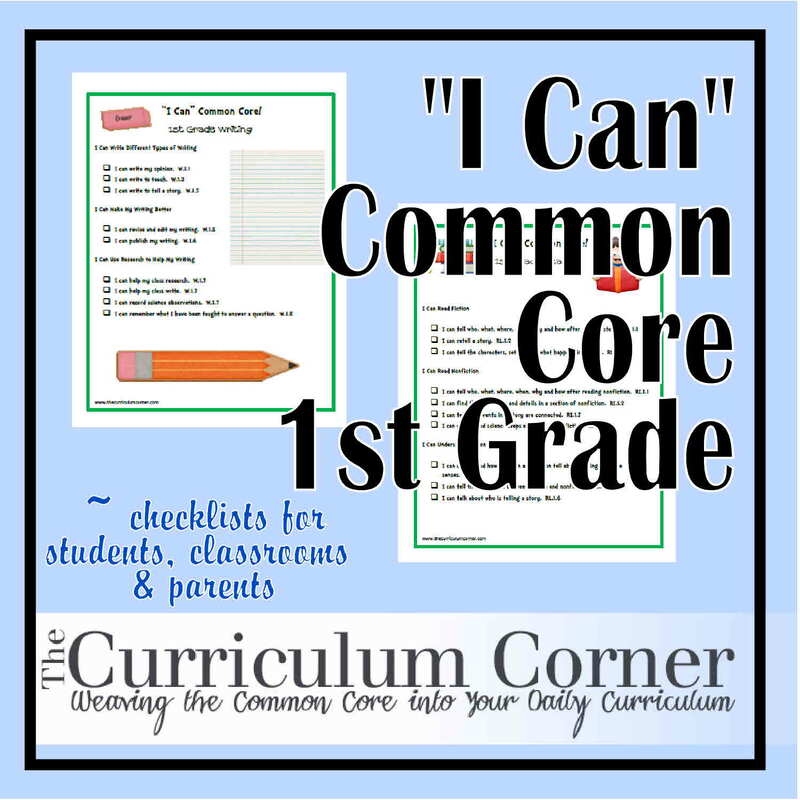 I am looking for resources to start implementing common core and these posters are great! Looking over the 1st grade reading nonfiction, the last 2 bullets (history & Science steps)pertain to 2nd grade ccs. 1st grade needs the last nonfiction added: connection between two individuals, events, ideas or pieces of information. Can you change this? THanks. Thank you, Candy! We have fixed the standards. We appreciate your help! Thank you for making my job easier. These are wonderful!!! Fantastic! Thank you so much! They are perfect for first graders to understand. Thank you f sharing them. 🙂 Happy Teaching! You are a lifesaver! I was lamenting writing these myself just because there are so many other things to do in the classroom, but these are perfect! Thank you!!! Can you send these to me in a word document so that I can translate them for my Non-English speaking parents? Love these for my kids, parents, and myself! Thank you. Hi Sarah! We actually have the first grade I Cans being translated right now. They are supposed to be completed by September 6th (tomorrow). We will get them posted this weekend. The rest of the grades are coming in sequence as our translator can get them finished. Hope this helps! We are very excited about having them available! Yay!!! Thank you!. I love how nice these are laid out and was trying to cut and paste but they were looking so sloppy. Hi! Do you know when you’ll have the”Ican” for 2nd grade in Spanish ready? I Esmerelda! Our translator is working on 2nd grade now! As soon as she completes them we will get them posted! Thanks! This is just what I was looking for! This is a FANTASTIC artifact!!!!! I love all of the I CAN checklists!!! THANK YOU!!!!! What happened to the Spanish resources for Common Core ?????? Hi Catalina. We apologize, but we pulled the Spanish versions of the I Can standards because we were informed they contained some mistakes in the translation. There is someone working on the fixes right now. Keep checking back. We hope to have something posted soon. Thanks! Thanks so much! These are the best learning targets that I have seen thus far! Keep up the great work. Thank you so much for all of your hard work. This is incredible. Thanks so much! Your hard work has made mine a little easier, and helps me see and understand common core a little better. This is wonderful. Any chance the Spanish Can Do’s will be put on the website anytime soon? Hi Chris and thanks for your inquiry! We are currently updating and streamlining our I Can statements and have someone who is working to translate this new version. All of it should be up by June along with some fun new posters for your classroom! Stay tuned! We are excited! I have loved the hard work that you put into these I can statements and referenced them weekly through out the year. I wish you still had the old version available on the website as I have lost the file on my computer, and I really do not like the new version that is available for download. Hi, Jessica! What did you like better about the old version? Please let us know. Hi! Thank you for your hard work in creating these posters for us. Any updates on the Spanish versions for science & social studies? Hi Terry! We are still waiting to receive the translations for kindergarten thru 2nd grade. The person doing those translations is also a teacher and had an extended school year due to the weather in January. She is trying to finish up her year and get them to us. We hope to hear from her in the next few days, then we will work to get them onto posters. We are just as excited as you to get those out, so keep checking back! THANKS! Hello! I love these! I was wondering if you wouldn’t mind me using these in a pacing guide that I am making for my first grade teachers. It is of course a free resource. I will also give credit in the guide and send a link back to your site so that they can download the full size posters. These are so helpful!